If you’ve ever wanted a window into Colorado’s budding marijuana industry, this dispensary is for you. The Green Solution has carved a 270-degree viewing room out of the grow operation adjacent to its Denver recreational dispensary at 4400 Grape Street. Dubbed the “Retail Cultivation Experience,” it’s about as up-close-and-personal as cannabis consumers can get with a legal grow operation. It’s open for customers from 9 a.m. to 9 p.m. daily — day time for the 363 plants on view. “For people that are out of state, this is so taboo. For us here in Colorado, it’s just another day in the office,” Regional Manager Casey Efting said of the viewing room around which the dispensary’s entire retail operation orbits. As dawn breaks in the grow room, a facility manager lifts the retractable door and an orange glow spills into the dispensary. Among the first to get a peek at the plants on this day was William Coley, a tourist from “a very conservative, very southern, traditional Baptist area” of North Carolina. This was his first visit to a marijuana dispensary. His first impression: paranoia — and olfactory overload. 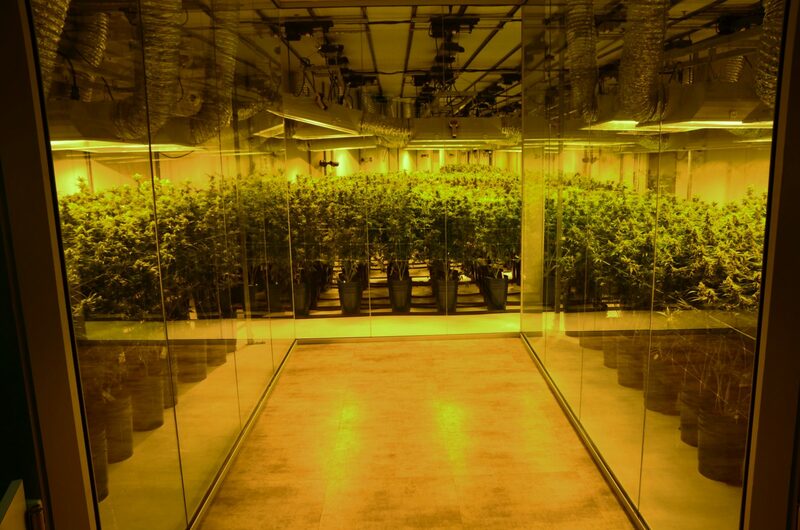 The plants on view represent less than 10 percent of those growing in TGS’s Grape Street facility, which itself is a fraction of the company’s Colorado cultivation operations, comprising 300,000 square feet in four grow facilities, according to officials. Beyond the spectacle and stench of legal marijuana, the glass room provides a glimpse into the nuts-and-bolts of cannabis horticulture as TGS cultivation technicians tend to plants as customers look on. They’ll spend two months growing here before they’re ready to be harvested, cured, and sent to packaging, Efting said. The plants Coley saw have about two weeks left in their growing cycle. If a plant that piques a customer’s interest, they can turn around buy that strain in the store, Efting said.